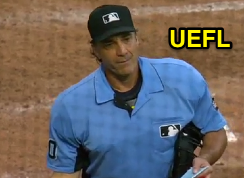 HP Umpire Phil Cuzzi ejected Braves LF Matt Kemp (strike two call) in the bottom of the 8th inning of the Mets-Braves game. With two out and one on (R1), Kemp took consecutive 3-0 and 3-1 pitches from Mets pitcher Neil Ramirez for called strikes before grounding out on the ensuing 3-2 curveball. Replays indicate that both the debated pitches were located off the outer edge of home plate and thigh high (STRIKE 1 CALL: px 1.084, pz 1.684 [sz_bot 1.565]); (STRIKE 2 CALL: px 1.439, pz 1.711), the call was incorrect. * At the time of the ejection, the Mets were leading, 6-1. The Mets ultimately won the contest, 8-1. This is Phil Cuzzi (10)'s fourth ejection of the 2017 MLB regular season. Phil Cuzzi now has 2 points in the UEFL Standings (4 Previous + 2 MLB - 4 Incorrect Call = 2). Crew Chief Phil Cuzzi now has 0 points in Crew Division (0 Previous + 0 Incorrect Call = 0). *This is Matt Kemp's 7th consecutive season with at least one ejection, the longest such active streak. This is the 62nd ejection report of 2017. This is the 25th player ejection of 2017. Prior to ejection, Kemp was 0-4 in the contest. This is Atlanta's 2nd ejection of 2017, T-2nd in the NL East (MIA 5; ATL, NYM, WAS 2; PHI 1). This is Matt Kemp's first ejection since September 23, 2016 (Adam Hamari; QOC = Y [Balls/Strikes]). This is Phil Cuzzi's 4th ejection of 2017, 1st since May 22 (Clint Hurdle; QOC = N [Balls/Strikes]). Wrap: New York Mets vs. Atlanta Braves, 6/10/17 | Video via "Read More"